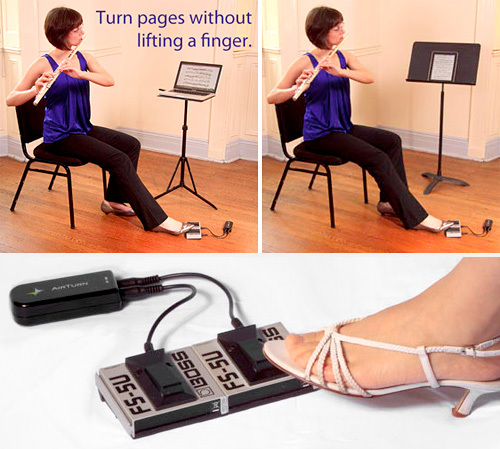 AirTurn BT-105 Bluetooth Foot Pedal Page Turner | OhGizmo! It’s not like traditional paper sheet music was ever able to turn itself, and in my mind, hitting the arrow key on a laptop or swiping your finger across the iPad seems a lot easier than re-shuffling a stack of pages while playing an instrument. But since I’m no musician, who am I to question if this Bluetooth foot pedal from AirTurn actually makes things easier or not? The device itself is basically a BT transmitter which connects to a handful of foot switches from the likes of Boss or Roland, and it seems to work with pretty much any application you’d need it to including Acrobat, Word, PowerPoint, Keynote etc. The transmitter is powered by a couple of AAs which should keep it running for a few weeks, and it has a range of up to 100 feet which seems a bit overkill. For $39.95 you can get the AirTurn transmitter and receiver by itself, but the company also sells bundles with Boss forward and back foot switches and their Music Reader software which pushes the price tag to close to $200. Turn the page… wash your hands… turn the page… wash your hands… turn the page… wash your feet? very interesting. now I know one more thing which BT can be used. thanks for sharing. Where can I get this in Australia? I have the Footime, got it from Music Reader site, is great but cant disasemble the lead which means it could break at a gig. This wireless one looks good but the 2x boss pedals make it too expensive, dont have quiet touch pad for classical gigs and they are loose which means they can be knocked about when your searching for the pedal and watching the music. Saw the package deal for $115.